How much do PlanOmatic's real estate marketing services cost? Our pricing structure is based on style of photography, Classic or Pro, and the number of images needed. There is always the ability to add a floor plan to your photography package for only $100. This gives you the flexibility to order exactly what you need for your listing. Our Classic Photo Package includes our standard photography editing process, as well as blue sky and green grass treatment on one primary exterior image. The Pro Photo Package includes PureShot Photography Enhancement Process, blue sky treatment on all interior and exterior photos, green grass treatment on all exterior photos, and virtual fire added in every fireplace. 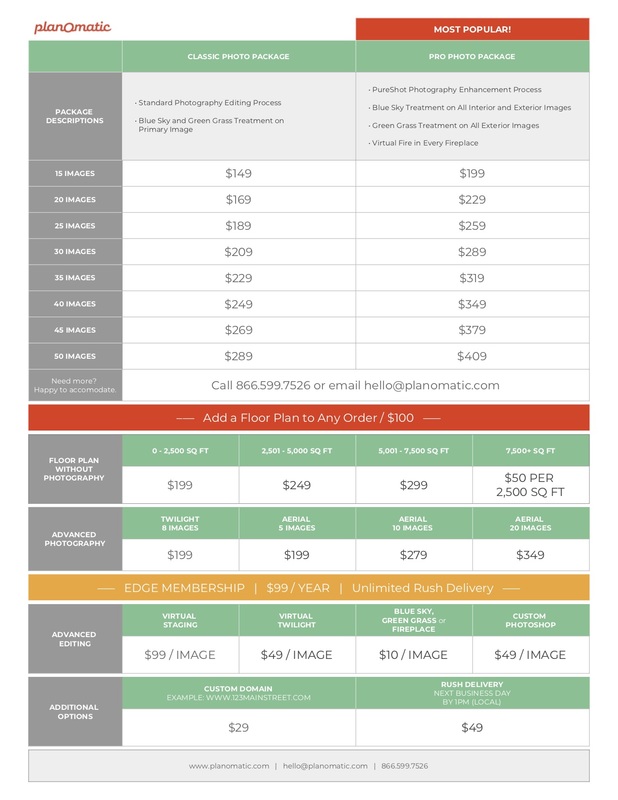 The pricing sheet below outlines the costs associated with Classic or Pro Photo Packages as well as Floor Plans and other services offered by PlanOmatic. For more information on related to pricing, visit the pricing page on our website.